SELLER MOTIVATED Expansive Villa compound with incredible ocean and mountain views. One of the most exclusive properties in Playas Del Coco offering: over 4 acres, 4 bedrooms, movie room, 4 baths, two one bedroom guest houses, care takers apartment, covered terrace and rancho with incredible outdoor entertainment area, outdoor kitchen, bar, bathroom, shower, pool, and a garage for 5 cars. There is a power generator on site capable of providing 100% of the electricity and a private water system that includes a 16,000 gallon water reserve tank. Additional and contiguous lots available to purchase and/or negotiate a package. 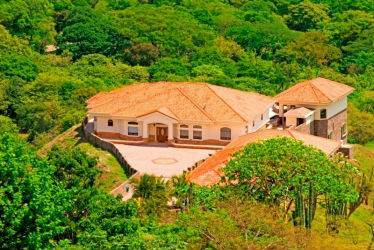 Purchase for a corporate retreat, multiple family compound or for someone desiring a large and secluded Estate. Only 30 minutes from the International Airport in Liberia and minutes to the full service town of Playas Del Coco. Price includes other lots (sizes not included) call agent for details. Price reduced from $2,500,000 to $1,750,000 !